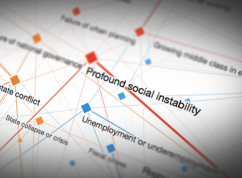 This section of the Global Risks 2015 report presents deep-dives into three “risks in focus” – the interplay between geopolitics and economics, rapid and unplanned urbanization in developing countries, and emerging technologies – that emerged from the Risks Interconnections Map and the Risks-Trends Interconnections Map (see Figures 2 and 3). 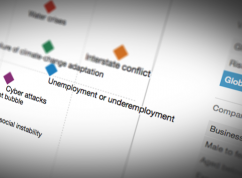 These provide good illustrations of the links between different global risks. The analysis in the following pages is based on follow-up research and interviews with experts. 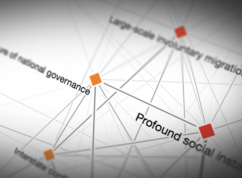 As discussed in Part 1, geopolitical risks are back, as evident from the central node of the failure of national governance in the interconnections maps, and the strong linkages to interstate conflict and profound social instability, among others. With economies tied together on an unprecedented scale by financial and trade flows, many analysts are concerned about the resurgence of the trend towards the interplay between geopolitics and economics. While national governments in the past also made use of economic tools to increase their relative power, today’s strong economic ties arguably make this interplay more complex and therefore more difficult to navigate. This resurgence could have profound implications for the effectiveness of global governance mechanisms in other areas, from combating climate change to reaching an international solution for Internet governance. Even as nation states step up their efforts to maintain or expand power, urbanization is slowly but surely rebalancing the locus of power from national to city governments. The data gathered for this report suggest that urbanization is a critical driver of profound social instability, failure of critical infrastructure, water crises, and the spread of infectious diseases (see Figure 3). This will only be further exacerbated by an unprecedented transition from rural to urban areas: by 2050, two-thirds of the world’s population – an estimated 6.3 billion people – will live in cities, with 80% in less developed regions.1 Rapid and unplanned urbanization in these regions has the potential to drive many risks. How effectively the world addresses global risks, ranging from climate change to pandemics, will increasingly be determined by how well cities are governed. The concentration of a large number of people, assets, critical infrastructure and economic activities means that the risks materializing at the city level have the potential to disrupt society. From artificial intelligence to synthetic biology, the need for governance on a global scale comes into focus when considering emerging technologies, given the many uncertainties about how emerging technologies evolve and their far-reaching economic, societal and environmental implications. The data also point to strong interconnections with man-made and natural environmental catastrophes (see Figure 2). The coming years are likely to see rapid advances in such fields as artificial intelligence and synthetic biology – and while many of their impacts are likely to be beneficial, negative effects will spread quickly in today’s hyperconnected world. Some of those negative effects may be difficult to anticipate and safeguard against. In many cases, by addressing the trends underlying most of the risks, the vulnerability to risks can be reduced significantly. In addition, understanding the context and possible trajectories of a significant nexus of risks and trends can help to clarify ways to address them and to capitalize on opportunities presented by the trends. That is the aim of the analysis that follows. 1 United Nations DESA, 2014.